Toronto Film Society presented Born to Kill (1947) on Monday, July 31, 2017 in a double bill with Gun Crazy as part of the Season 70 Summer Series, Programme 4. Distribution: RKO Pictures. Producer: Herman Schlom. Director: Robert Wise. Screenplay: Eve Greene, Richard Macaulay, based on the novel “Deadlier Than the Male” by James Gunn. Cinematography: Robert De Grasse. Music: Paul Sawtell. Editor: Les Millbrook. 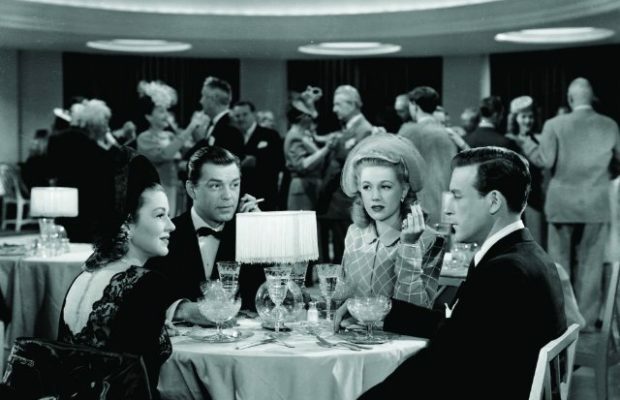 Cast: Claire Trevor (Helen Brent), Lawrence Tierney (Sam Wilde), Walter Slezak (Albert Arnett), Phillip Terry (Fred Grover), Audrey Long (Mrs. Kraft), Elisha Cook, Jr. (Marty), Isabel Jewell (Laury Palmer), Esther Howard (Mrs. Kraft), Kathryn Card (Grace), Tony Barrett (Danny), Grandon Rhodes (Inspector Wilson). Born to Kill stars the versatile Claire Trevor and the eccentric Lawrence Tierney. There’s much here to keep us watching these off-balanced personalities in this Robert Wise directed film. Designer Edward Stevenson beautifully clothed Trevor in outfits that helps put the audience on edge while subtly emphasizing her distorted character. Three designs that struck me in particular is the dress with the sewn-in off-kilter necklace, the suit with the perfectly aligned purse, and the silky negligee with the one-sided bangle shoulder design. Lawrence Tierney was a hit in the 1945 film Dillinger but seeing himself as a bit of gangster in real life, he sabotaged his chances many-a-time missing out being cast in big studio pictures. He was the oldest brother of actors Scott Brady, who played in Joan Crawford’s 1954s Johnny Guitar and Edward Tierney who acted opposite his eldest brother in The Hoodlum made in 1951. A quirky choice of roles for two brothers to play together, where one brother heavily abuses the other’s trust. Another interesting anecdote is in regard to Tierney’s role as Elaine’s father on a Seinfeld episode titled The Jacket. Not only are the characters George and Jerry uncomfortable with the character Alton Benes but the reason Elaine father’s character never recurred was because of Tierney’s odd behaviour on the set. Although cast and crew members were very impressed with Tierney’s performance, during filming it was discovered that Tierney had stolen a butcher knife from the knife block in Jerry’s apartment set. Various cast members remember Seinfeld encountering Tierney and asking what he had in his jacket. Tierney, realizing he had been caught, tried to make a joke about how he thought taking the knife would be funny, by reenacting a scene from Alfred Hitchcock’s Psycho (1960), holding the knife above his head and making threatening motions towards Seinfeld. Jason Alexander, Julia Louis-Dreyfus and series director Tom Cherones saw this happen, and, Alexander recalled, it scared the living daylights out them. Cherones stated that, afterwards, Larry David would jokingly threaten to have Tierney back on the show if Cherones did his work badly. With a good supporting cast led by Elisha Cook Jr. playing the needy loser, Marty, he lets us know that even though he’s only known Sam for five years, he has his back in every situation. Which is kind of like the devil having a guardian angel. Walter Slezak may be best known for his role in Hitchcock’s Lifeboat (1944) but it was also interesting to learn that he was first discovered by director Michael Curtiz and actually was a matinee idol in German films of the 1920s. 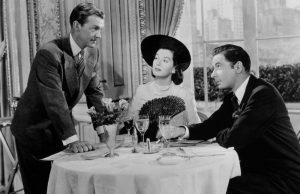 Phillip Terry, who plays Trevor’s handsome fiancé Fred, was Joan Crawford’s third husband, married in 1945 and divorced the year before making tonight’s film. Meaning, the marriage didn’t last long. Tony Barrett who plays the small role of Danny did more than just act. Besides writing for TV shows produced in the 60s and 70s, he developed the 1960s TV show The Mod Squad. And if you get a deja vu feeling that you are hearing Bogart speak, you’re not the only one to do so. With never a dull moment, we hope you enjoy Born to Kill. Plot: A man and a woman meet on a train from Reno to San Francisco. The woman (Trevor), who has just obtained a divorce, has come across the bodies of a murdered man and woman, but has decided not to report this. The man (Tierney) has killed the pair out of jealousy. The couple are attracted to each other and their relationship survives his subsequent marriage to her half-sister for money and status, and even her discovery that he is a murderer. Meanwhile, a cheerfully corrupt private detective investigating the original killings (Slezak) has to deal with attempted blackmail and more murders as he searches to solve the mystery. Robert Wise (1914-2005): Began his film career as an editor, notably on Citizen Kane, and also shot some scenes of The Magnificent Ambersons when Welles left the film to work on his never-finished South American project. He got his first solo directing job in 1944 on Val Lewton’s stylish horror film The Curse of the Cat People, and subsequently enjoyed a prolific and prestigious career working in almost every possible film genre: horror, film-noir, western, war, sports (boxing), science fiction, melodrama, and musical. Though rarely regarded as an auteur with a strong and distinctive personal style and vision, he was a thorough professional who won the respect of his peers and those he worked with, and had several hugely popular successes. His films include: The Body Snatcher; Born to Kill; The Set-Up; The Day the Earth Stood Still; I Want to Live! ; Odds Against Tomorrow; The Haunting; The Sound of Music; The Sand Pebbles; and The Andromeda Strain. He received the AFI Life Achievement Award in 1998, among many other awards and honours. Claire Trevor (1910-2000): Nicknamed the “Queen of Film Noir” because of her many “bad girl” roles in films of this genre, she was born Claire Wemlinger in Brooklyn, and studied art at Columbia University and acting at the American Academy of Dramatic Arts. She first appeared on Broadway in 1932 and then signed with Fox Film Corporation, where she made several B-features before appearing in the prestigious Dante’s Inferno (1935) and then Dead End (1937), both of which gained her star status. Her best-known performance, and probably her best, was in Stagecoach (1939). After that, she appeared mostly in thrillers such as Key Largo; Murder, My Sweet; and Raw Deal, as well as Born to Kill. From the 1950s onwards, she varied her screen roles in such films as The High and the Mighty and Two Weeks in Another Town, with returns to the theatre and several appearances on television. She was married three times and divorced twice; her third husband, Milton Bren, died in 1979, and she made few film or television appearances afterwards. Lawrence Tierney (1919-2002): Born in Brooklyn, he was a star athlete at school and college before taking on a random series of jobs and then becoming interested in the stage, where he was spotted by a talent scout for RKO and given a film contract in 1943. After some supporting roles in B-movies, he achieved fame as the title character in the low-budget and often banned Dillinger, in 1945. He proceeded to a series of tough guy and usually criminal roles that were often condemned by critics for their nastiness, though Tierney himself protested that he was “a nice guy who wouldn’t do rotten things”, but had to take these roles for the picture. Meanwhile, his often violent and highly publicised behaviour off-screen began to hurt his career and led, over a dozen times, to arrest and imprisonment for offences such as assault and being drunk and disorderly. After living in France for some years, he returned to New York, where he alternated between working as a labourer and occasional film parts, before resuming a sporadic film and television career in Hollywood, mostly in supporting roles, such as in John Huston’s Prizzi’s Honor (1985), but received acclaim for his role as a crime lord in Quentin Tarantino’s Reservoir Dogs (1991). His personal behaviour had changed little, however, and he continued to get in trouble with the law until his death at the age of 82. Walter Slezak (1902-1983): Austrian born, he acted in several Austrian and German films, including Michael Curtiz’s Sodom and Gomorrah (1922), before migrating to the U.S. in 1930 where, after some years on Broadway, he appeared in over 100 films, his first Hollywood work being Once Upon a Honeymoon (1942), with Ginger Rogers and Cary Grant. 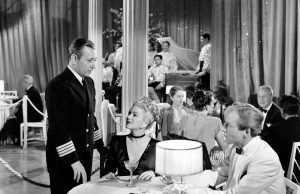 He often played villains or thugs, such as the German U-boat captain in Hitchcock’s Lifeboat (1944), but also had many lighter and more sympathetic roles, such as in Sindbad the Sailor (1947); People Will Talk (1951); and Treasure Island (1972). He committed suicide in 1983, apparently depressed over his advanced physical illness. Elisha Cook, Jr. (1903-1995): He was born in San Francisco, had an early appearance on the stage at the age of 14, and later acted in the two-year run of Eugene O’Neill’s Ah! Wilderness on Broadway, before moving to Hollywood in 1930, where he specialised in roles involving weaklings or sadistic losers and hoods; his most memorable such roles being in The Maltese Falcon (1941) and The Big Sleep (1946). He rarely emerged alive at the end of these films, having been strangled, poisoned, or shot in the meantime. He also made memorable appearances in Shane; The Killing; and Rosemary’s Baby, and appeared often on television. He married twice, but spent a lot of time on his own, fishing in the High Sierra, until summoned by a courier from Hollywood to tell him that he was wanted for a film role.